Toronto is a city filled with culture, food, fashion, entertainment and nature. It’s no wonder so many people come to visit often, and when they do, they stay in furnished condo rentals to get the feel of the town. With so many restaurants, bars, clubs, shops and parks, location is essential to getting the most for your money. 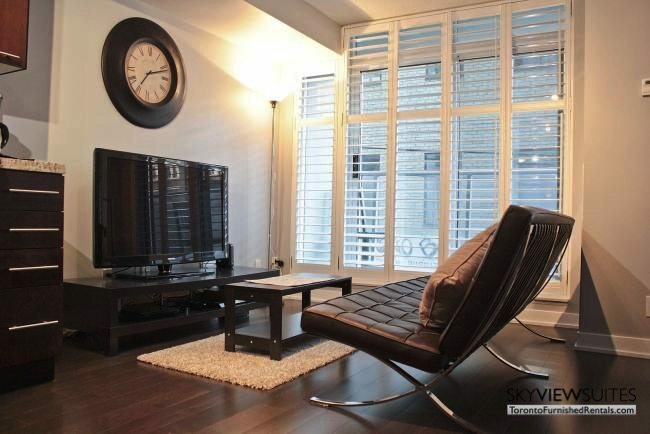 The Boutique condo is a wonderful choice because of the close proximity to everything. 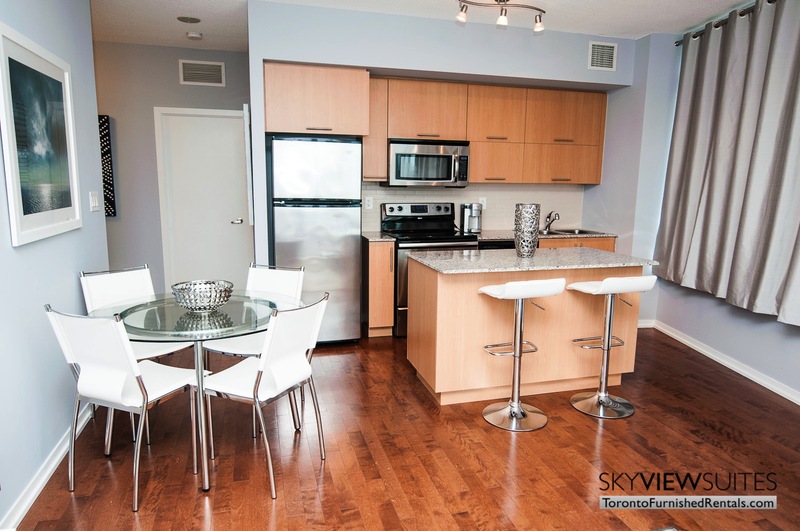 This fully furnished apartment in Toronto is a beautifully decorated unit in the center of Toronto’s entertainment district. 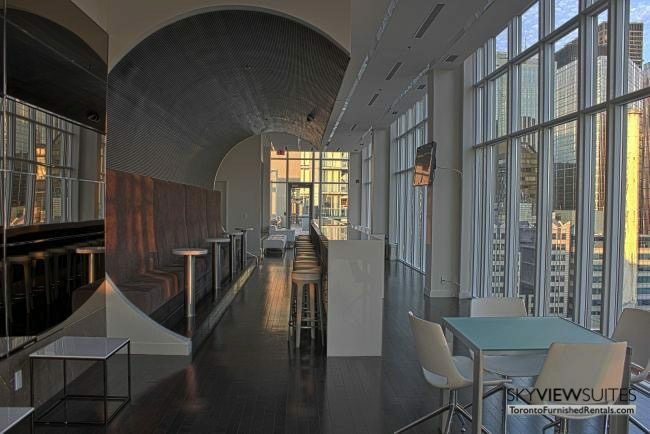 In the Boutique building which aspires to blend chic condo living with a fantastic downtown lifestyle. Situated at the corner of Nelson and Simcoe, Boutique residents enjoy the greatest that downtown Toronto has to offer. The one bedroom suite features an open concept layout, making it appear larger than reality. It has a nice kitchen with plenty of granite countertops, brand new black appliances and an adjacent dining table which seats four and saves space when not in use. It opens to the living room which has trendy seating and a flat screen television. The carpeted bedroom has a queen sized bed with fine, high thread count linen sheets, an upholstered headboard and an en-suite bathroom. The washroom has spectacular spa-like finishes including marble counters with a waterfall feature as well as an under mount sink. There is plenty of storage space underneath the sink and in the walk in closet right next to the door. Additionally, there is a separate area for reading, working or studying; an efficiently designed station makes it convenient. Free wireless internet and digital TV is included throughout the duration of your stay. Also, every two weeks there is a cleaning service which comes by to freshen up your sheets and towels. There is a washer and dryer inside the suite as well, so feel free to clean your clothes. This iconic building is steps to both the entertainment and financial districts, giving our extended stay guests and Toronto corporate housing clients the opportunity to stay in touch with the city’s heartbeat. The suite boasts top of the line finishes, including engineered hardwood flooring, granite countertops and island, and a spa-inspired bathroom accessible from both the bedroom and the living room. With a sleek and contemporary design, the glass-encased 35-storey tower features some of the best finishes and amenities in Toronto, including a counter-current pool with private outdoor cabanas. From the gorgeous lobby to the stunning suites designed by ZAS Architects and Cecconi Simone Interior Design, there’s no doubt you’ve arrived at one of Toronto’s best addresses. 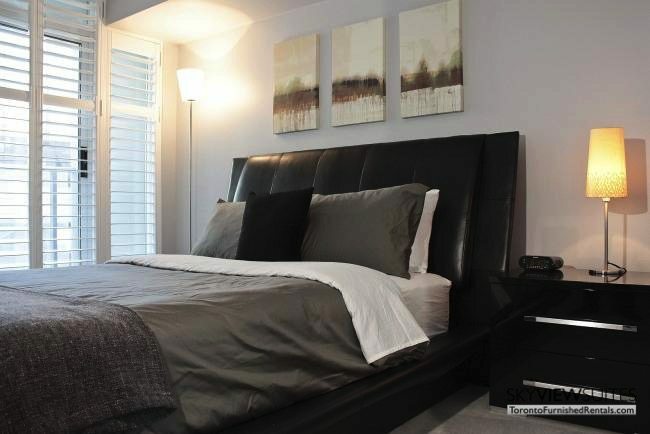 For more information about this unit and to make your Toronto accommodations, visit the Boutique furnished apartment page.